After reading that T. E. Lawrence used a Colt frontier revolver during World War One, I sought to determine what model he used and its current location. No one seemed to know the answers to these questions – not even the experts at the Imperial War Museum. Finally, on reading a letter to Lawrence from his brother Frank, I was able to deduce the model of pistol he used at the beginning of the war. However, I have not been able to determine its current location or even if it still exists. T. E. Lawrence – “Lawrence of Arabia” – was an archaeologist, soldier, writer, and designer of high-speed boats. He was a man of keen intelligence and great energy and athletic ability. In high school he could run a mile in under five minutes and in his thirties, without training, he could broadjump twenty-two and a half feet. In Arabia he gained the respect of the tribesmen by being able to mount a running camel and outride their best riders. Winston Churchill considered him one of the greatest geniuses of the twentieth century and John Buchan, the author of “The Thirty-nine Steps” and Governor-General of Canada, said he was one of the few men that he would follow anywhere. Lawrence was born the illegitimate son of an Anglo-Irish baronet and educated at Oxford where he (and his brothers) learned to shoot at an Oxford rifle club and in the Officers Training Corps. His intelligence and good judgment were shown in his choice of weapons and, especially, in his deployment of them in battle in World War One. Even as a university undergraduate traveling in the Middle east in 1909, he carried a modern weapon of good quality, a Mauser model 1896 semi-automatic pistol with a capacity of ten high-velocity cartridges. He mentioned this pistol in a letter to his mother written in October 1909, informing her that he “sold my Mauser pistol (at a profit) in Beyrout on my departure (5 pounds)”. When he went to war in 1914 officers could use the pistol of their choice and Lawrence, like Churchill, chose the Colt Model 1911 which is still considered one of the finest combat pistols of all time. After graduating from Oxford, from 1911 to the spring of 1914, Lawrence participated in an archaeological excavation at Carchemish near the Euphrates River in Turkey. His leisure activities included marksmanship practice and occasional hunting. Firearms he mentions in his letters are a Mauser pistol and a Mannlicher-Schoenauer carbine. A photograph of Dahoum, a close friend of Lawrence’s, shows him holding a pistol, presumably Lawrence’s. It appears to be a Colt automatic, possibly a model 1908. His letters from Carchemish indicate a high level of skill with both rifle and pistol. In February of 1913, he reported hitting a six gallon petrol tin with a Mannlicher-Schoenauer carbine four shots out of five. In June of that year he wrote that he hit a medjijie (a Turkish coin) five shots out of seven at 25 yards with a Colt automatic pistol rapid fire. He also stated that he has been getting sure of medjijies and eggs at 25 yards, hit an orange crate five times out of five at 500 yards with the Mannlicher carbine and finally put three shots out of ten in a meter square target at 1,200 yards. In October 1913 he wrote that when two people came, they had no meat for them so he shot two ducks with a pistol, targeting the head. Lawrence served in the British Army from 1914 to 1918, rising in rank from second lieutenant to colonel. He served in the Geographical section of the General Staff (Intelligence) in London until December 1914, then transferred to Cairo. There he was engaged in the preparation of maps, interviewing of prisoners and writing intelligence reports. In 1916, he became a liaison officer to the Arab forces in the Hedjaz and began the campaign that resulted in his name becoming a household word for most of this century. The Colt is a lovely pistol. The more I examine it the more I like it. There is a vast gulf between it and the ordinary revolver. If you want anything in connection with it which you don’t want to write for I could get it for you. They keep two weights of bullets, I think 200 and 230 grains. The lighter weight has considerably higher velocity and penetrating power, though I suppose less shock. Like most British soldiers, if not most officers, Lawrence used a Short Model Lee-Enfield rifle. Perhaps not surprisingly, his rifle had a rather colorful history. The rifle, originally issued to the Essex regiment, had been captured by the Turks at Gallipoli. It is one of four that had been inscribed in gold with the legend “Part of our booty in the battle for the Dardanelles” and presented by Enver Pasha, the Turkish ruler, to each of the sons of the Sherif of Mecca. 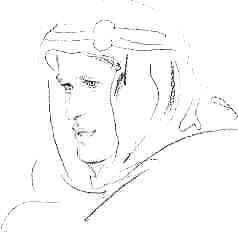 One of these sons, Feisal, the leader of the Arab forces fighting with Lawrence against the Turks, presented his to Lawrence. Lawrence’s initials, T.E.L., and the date 4.12.16 (for December 4, 1916) are carved in the stock just above the magazine. There are also five notches carved in the stock, each representing a Turk shot with this rifle before Lawrence stopped counting his kills. After the war, Lawrence presented the rifle to King George V. It was later place in the Imperial War Museum where it is now on exhibit. Lawrence mentions this rifle in “Seven Pillars of Wisdom”, his story of the Arab revolt. Lawrence was quick to recognize and adopt technological advances. He became an early advocate of the use of automatic weapons, replacing his rifle with a light machine gun which he carried in a scabbard on his camel. This weapon was a Lewis machinegun in the aircraft configuration without the heavy radiator, casing and shoulder stock found on the models typically used in the ground role. The Lewis used 47 or 97 round magazines and , according to Lawrence, fired “a wonderfully dispersed pattern”. After his exploits became known to the Turks and they offered a large reward for his capture dead or alive, Lawrence recruited a personal bodyguard that numbered up to ninety men. This group had extraordinary firepower for its size, for in addition to their rifles, pistols and daggers, they were equipped with one machine gun for each two men. After the war, Lawrence wrote his memoir of the Arab revolt, served with Winston Churchill in the Colonial Office and then enlisted in the Royal Air Force where he remained until shortly before his death in a motorcycle accident. Lawrence did little recreational shooting during this period. He is reported to have kept a Webley revolver in his cottage, Clouds Hill and fired it at a tree on his property. One collector removed the bullets from that tree when it was cut down. Today Lawrence memorabilia, from his letters and Arab robes to his daggers, is in great demand by collectors. The locations of many Lawrence-associated items are known. One dagger with a gold hilt and sheath, which he had made in Mecca, is in the vault of All Souls College in Oxford, England. Another of his daggers is in a private collection in San Marino, California. His letters and robes have sold for thousands of dollars at auctions. Unfortunately, except for the gold-engraved SMLE in the Imperial War Museum, the locations of Lawrence’s firearms seem to have vanished from record.